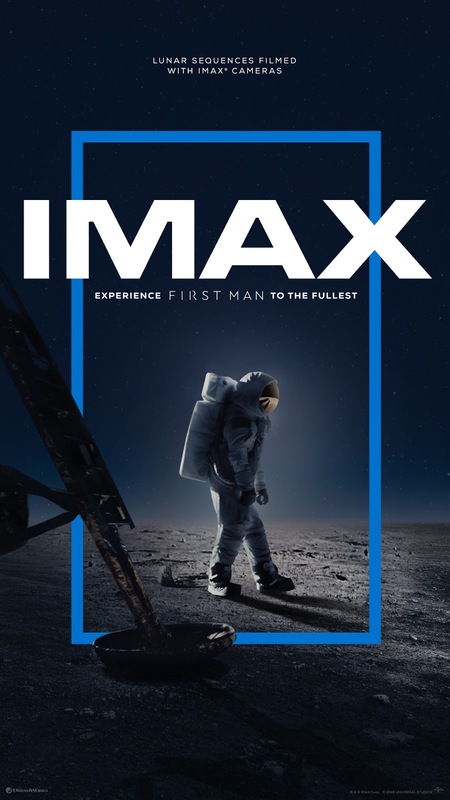 In the riveting story of NASA’s historic mission to land a man on the moon starring Ryan Gosling as Neil Armstrong, Oscar-winning director Damien Chazelle captured the breathtaking lunar sequences of the film with IMAX’s extremely high-resolution 2D film cameras… there is no better, more stunning way to experience this scene. In addition to delivering crystal-clear images, the picture will expand in the lunar sequences by up to 26% more than standard screens, only in IMAX, allowing moviegoers to experience the film the way it was truly intended. Couple those awe-inspiring images on the biggest screen with IMAX’s heart-pounding, one-of-a-kind sound technology, and audiences will be fully immersed and feel like they are in this story. The IMAX release of First Man will be digitally re-mastered into the image and sound quality of The IMAX Experience® with proprietary IMAX DMR® (Digital Re-mastering) technology. The crystal-clear images, coupled with IMAX's customised theatre geometry and powerful digital audio, create a unique environment that will make audiences feel as if they are in the movie. Universal Pictures’ First Man hits IMAX cinemas on October 12.